Following a perfect 3-0 run in Week 7 of the college football season, I got tripped-up with a pair of losses in the ACC last week to drop to 1-2 with my Week 8 top picks for FootBallBetting .com. Heading back to the drawing board with this Saturday’s schedule, I feel confident that I can get back on track with this week’s top picks. The following is a quick look all three plays based on betting odds from 5Dimes. Clemson’s perfect 7-0 start has it on course for a possible spot in this season’s four-team College Football Playoff so there is much more at stake than the ACC’s Atlantic Division title in this matchup. The Tigers are the cream of the conference this season behind an offense that is generating 465.4 total yards and 38 points a game. Add in a stifling defense that is ranked seventh in the nation in points allowed (14.3) and it is hard to see the Tigers getting tripped up this week. The Wolfpack come in with a profitable 5-2 record both straight-up and against the spread, but a loss to Louisville as home favorites coupled with a 15-point loss to Virginia Tech as 2.5-point road underdogs is troubling. NC State has clearly padded this record with a very weak nonconference schedule and this will be its first true test of the season against a ranked team. The result in my book is a lopsided loss that comes nowhere close to covering the 10 points at home. This is technically a neutral-site game for the Gators since it will be played at EverBank Field in Jacksonville. It will also be their first game since losing to LSU 35-28 on Oct. 17 as six-point underdogs on the road. This ended a string of six SU wins with a 5-1 record ATS. It is hard to know how Florida will react following this disappointing loss, but my gut feeling is that the Gators were a bit overrated to begin with. The Bulldogs run to the top of the SEC East standings came to a swift halt with back-to-back losses to Alabama at home and Tennessee on the road. Georgia was probably a bit overrated as well and the loss of running back Nick Chubb will not help its cause moving forward. However; when it comes to this head-to-head matchup I like the Bulldogs’ chances to cover with the three points. Georgia’s SU three-game winning streak against Florida came to an end last season so I also like the revenge factor kicking-in between these two bitter rivals. Vanderbilt is off to a 3-4 SU (4-2-1 ATS) that includes a 1-3 record in the SEC. The Commodores grinded-out a 10-3 victory against Missouri this past Saturday as 1.5-point underdogs at home and on the year they are averaging just 18 points a game. Their main strength remains a defense that is ranked 13th in the nation in points allowed (16.3). 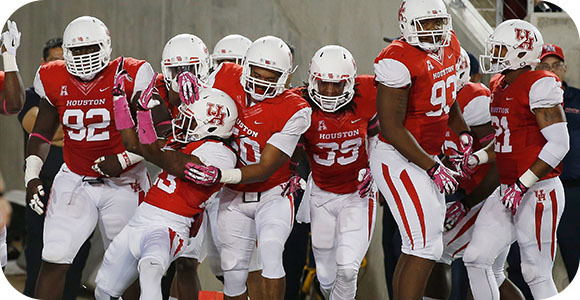 The Cougars are one of three teams in the AAC that remains undefeated and ranked in the AP’s most recent Top 25. They ran their SU record to a perfect 7-0 (5-2 ATS) with a 59-10 romp against Central Florida this past Saturday as 21-point road favorites. This successful run has been fueled by a running game that is averaging 291.6 yards a game and Houston is ranked fourth in the nation in scoring with 47 points a game. Throw in the fact that its defense is only allowing 19.7 points a game and it is hard to see Vanderbilt keeping things closer than two touchdowns on the road.